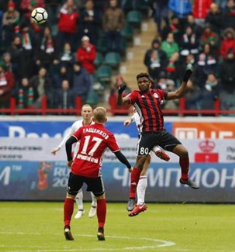 Nigeria international Aaron Samuel will be allowed to face his parent club CSKA Moscow when they face off with Amkar Perm, where is on loan for the remainder of the season, on Wednesday, April 18. Amkar Perm write on their official website that the terms and conditions of the loan agreement, which the heads of the two clubs concluded in February 2018, allow the player to participate in the game scheduled to hold at VEB Arena as from 2230 hours local time. It is all but confirmed that Samuel will start tomorrow's game as he has been named in the starting line-up in all the matches Amkar Perm have played since he completed his loan move. The striker was also allowed to face Avangard Kursk in the Russian Cup two months ago despite playing against the First Division side in September 2017 while wearing the jersey of CSKA Moscow. Samuel has scored two goals for Amkar Perm, with both coming against Lokomotiv Moscow, in 2018. Another Nigeria international striker, Ahmed Musa, is in line to make his 12th start for CSKA Moscow against Amkar Perm.